Shipping the item you sold on eBay can be the most time-consuming task for many eBay sellers, but it needn’t be. It’s your job as the seller to see that the item gets to the buyer in one piece. Your reputation is reflected in your professionalism at shipping. Before listing your item on eBay, get the package ready to ship. The time to think about packing and shipping is before you put the item up for sale — that way, last-minute shipping-related surprises are less likely to arise while your buyer waits impatiently for the item! The two critical factors in shipping are weight and time. The more a package weighs and the faster it has to be delivered, the higher the charge. So get the package ready to go first, and you have a head start on a timely and cost-effective delivery. Know your carrier options and compare their costs and services. In the United States, the three main shipping options for most eBay transactions are the U.S. Postal Service, UPS, and FedEx. Before quoting the shipping fees, make sure that you include all appropriate costs. And do your best to cover your costs without burdening your buyers. Some eBay sellers inflate shipping and handling costs to make added profit. Purposely overcharging is tacky. (It’s also a violation of eBay policy on circumventing fees and will penalize your listings in Best Match search.) The buyer also will figure it out after one look at the postage on the box. Charge a nominal handling fee (up to $1.00 isn’t out of line) to cover your packing materials, labels, and time, which can add up quickly as you start making multiple transactions. You should also include insurance and any delivery-confirmation costs in your handling fee. Post a flat shipping amount (or use the eBay online Shipping Calculator). This way, buyers can see this cost when they consider their bidding strategies. Figure out what the packed item will weigh and then give a good estimate; the online calculators can help. Occasionally, shipping calculations can be off-target, and you may not know that until after you take the buyer’s money. If the mistake is in your favor and is a biggie, notify the buyer and offer a refund. But if shipping ends up costing you a bit more, take your lumps and pay it yourself. Consider it part of the cost of doing business. You can always let the buyer know what happened and that you paid the extra cost. Who knows, it may show up positively on your feedback from the buyer! E-mail the buyer and congratulate him on winning; reiterate what your shipping choice is, and how long you expect delivery will take. Make sure that you’re both talking about the same timetable. If the buyer balks at either the price or the shipping time, try working out an option that will make the buyer happy. E-mail the buyer as soon as you send the package and don’t forget to put in a plug for positive feedback. If you can’t ship the package right away, immediately e-mail the buyer and explain the delay. Follow up with receipt confirmation. 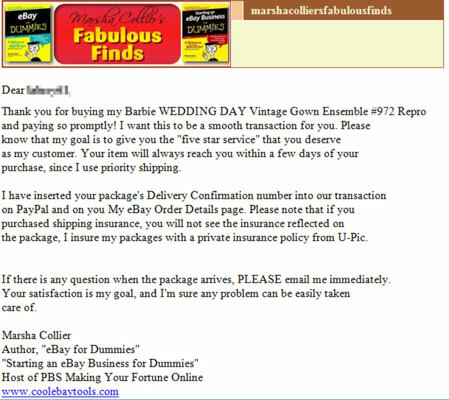 More often than not, you get an e-mail back from the buyer to let you know the item arrived safely. If you don’t, send another e-mail (in about a week) to ask whether the item arrived in good condition. It never hurts to take every opportunity to promote goodwill (and future business). Ask buyers whether they’re satisfied — and don’t be bashful about suggesting that they leave feedback for you. Good communication throughout the shipping process is essential for demonstrating your professionalism as a seller. Include a thank-you note (a receipt would be a businesslike addition) in each package you send out.